Want the taste of classic s’mores without building a campfire? 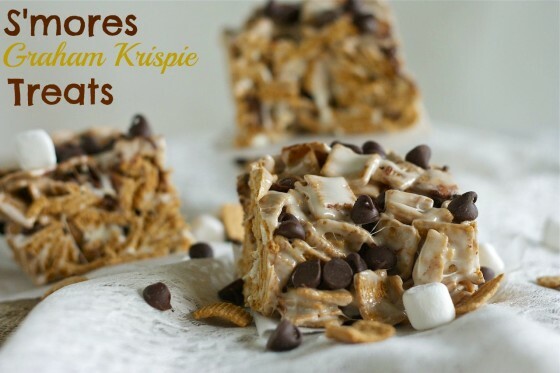 These s’mores graham krispie treats come together in a flash with just a couple of ingredients! Get your summer s’mores must have in a hurry! Are you going camping for the 4th of July? Oh lucky you! With it being right in the middle of the week (seriously?! ), I’m not entirely sure I’ll be able to steal away for an extended weekend of campfires, pine trees and ticks on the dog to get in an over abundant number of s’mores and beers. Dang!! So in lieu of that – I wanted to make an at-home version that would satisfy my whim for s’mores without fretting over flaming marshmallows, unruly campfire cinders, sticking said flaming marshmallow into my own hair as I wave it frantically around trying to extinguish the flames. It’s happened. Don’t judge. Blowing on the marshmallow just won’t do. This weekend whilst Ben was home from the Palouse for all of one whole day, we had several victories on the wedding front and I then had a near panic attack after having to as politiely-as-possible explain to a family member that they would not be invited to the wedding because – weddings are expeeeensseeevvveee and our guest list is nearly double of what we originally even wanted! I was a deer in the headlights. It didn’t go well. I nearly cried. However, for the weekend victories – we managed to secure our rings! After several trips to stores and retailers Ben was finally able to settle on a ring that isn’t quite “the one” since the one that he had his heart set one doesn’t exist. Somehow it is impossible to find a satin polished plain tungsten band – A.N.Y.W.H.E.R.E. Sure they come in titanium that scuffs and must be re-brushed every six months, but not one can be found in tungsten. This future “M-urse” needs sturdy, durable and resilient ring that isn’t trendy. Imagine that! Have you met Ben? Not trendy. And I love that. And – we also booked our HONEYMOON!! But, I will tell you about it is that we booked it through Costco! *insert shameless Costco plug* Gawd, I love Costco having even, yes – bought my wedding dress there. Their travel department was overwhelmingly helpful and we secured two extra discounts that we wouldn’t have been able to get if we hadn’t have called them and had someone personally check for those extra little hidden discounts for us. SCORE! I will say right now – that I will book with them again. Since the biggest fail of the weekend was telling my family member that they wouldn’t be able to attend our wedding and get the subsequent cold shoulder (we will be having a reception after we get back from the honeymoon for those who couldn’t attend!) I still feel like this was a pretty darn successful – yes stressful – weekend. So maybe these S’mores Graham Krispie Treats are equal parts Victory and Eat-My-Feelings treats. Either way, I’ll take it. 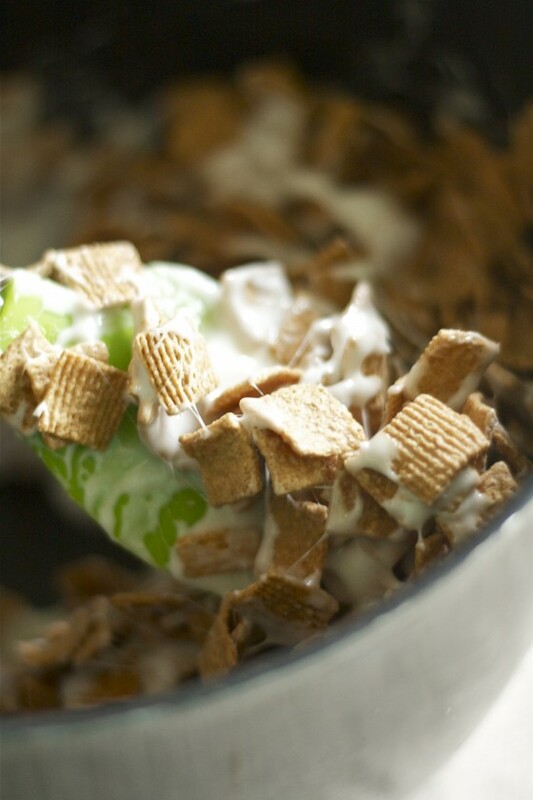 For these tasty mock-camping treats I substituted the traditional rice krispies with my all-time favorite childhood cereal – Golden Grahams. How can you not love these? And added in was an inordinate amount of chocolate chips to give them the melty chocolate effect we love so much when toasted marshmallows make out with Hershey bars and melt together in sinful bliss. 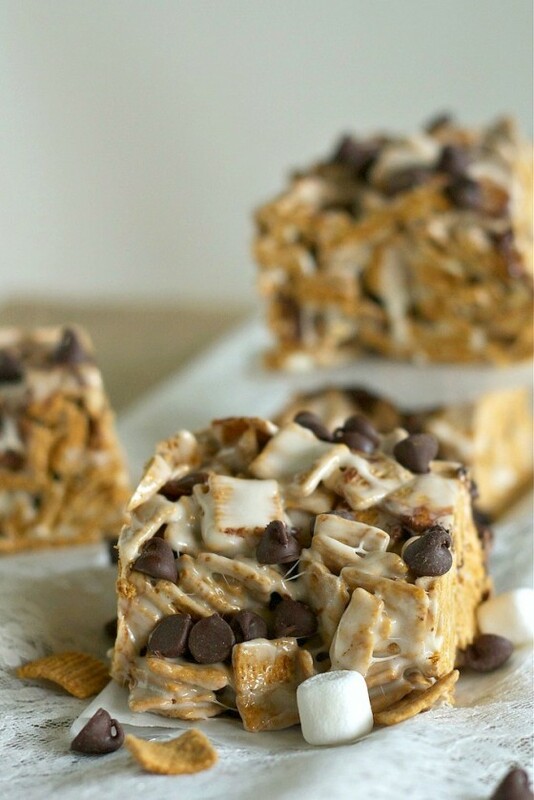 I just can’t turn down a s’mores graham krispie treat, and my family makes these all the time! 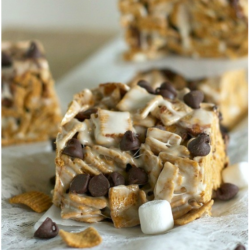 My SIL even said they made these s’mores graham krispie treats for her boyfriend’s family! So they are making their rounds! Sorry, that took an odd turn. 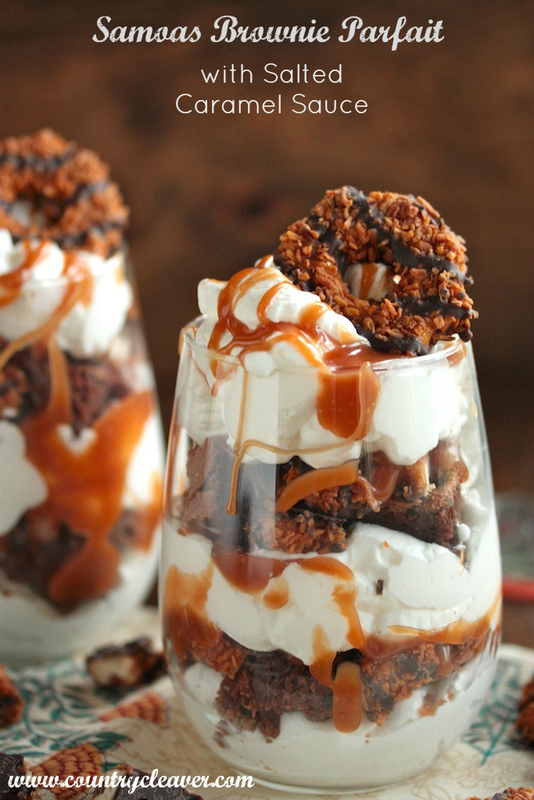 So if you’re not able to get out of town for the upcoming holiday weekend for a dose of the real thing, or you need a twist on a classic to celebrate a series of wedding victories or eat-your-feelings moments, just do yourself a favor and make these. Your taste buds will thank you, even if your jeans don’t. 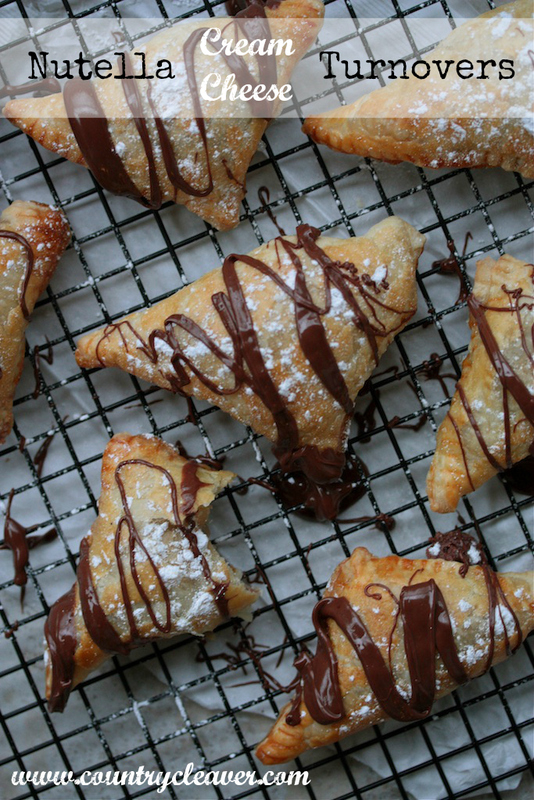 For more Chocoholic treats – you’ve gotta see these! If you like Marshmallows check out these Homemade Egg Nog Marshmallows – they are so easy it’s almost comical! Love S’mores? 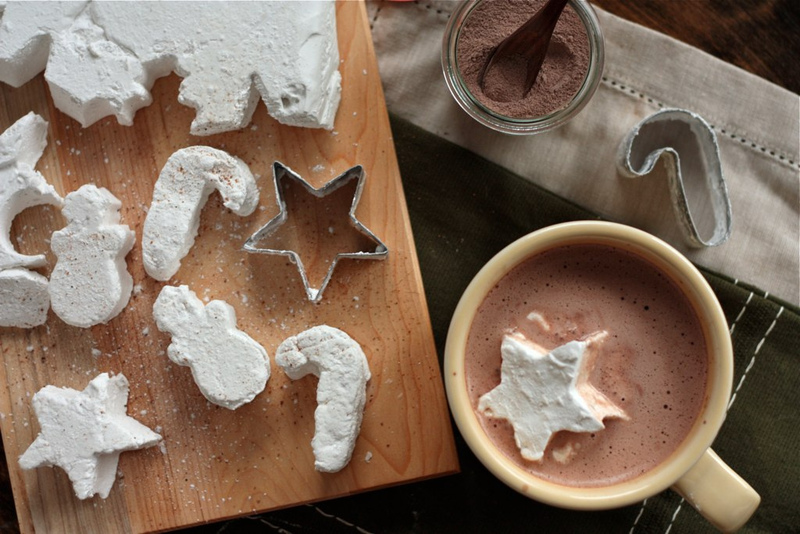 Get s’more ideas here! In a 9×9 inch baking pan, spray with non-stick cooking spray. Set aside.